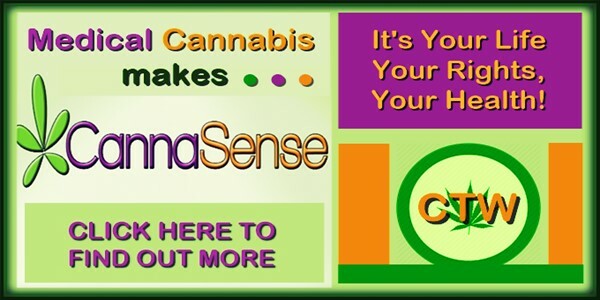 HomeGOVERNMENTDual Citizenship: Foreign Agents In Our Government? When you swear an oath of office to uphold and protect the Constitution and America, this assumes … no, it Mandates TOTAL Allegiance! There is no clause that stipulates you or your subsequent actions can be excused from this sworn duty if you have also sworn an oath of total allegiance to a foreign entity or state. To believe this is ridiculous at best and dangerous at worst. This would be an impossible scenario that would not bode well for America or We The People’s interests … Yet this is exactly what we are faced with in ever increasing scope and influence as time marches forward. AIPAC, and other related lobbies are an extremely powerful and influential force, with our bought and paid for leadership, banks, the Federal Reserve, and the media having their backs. They put continuous and unending pressure on the US Congress and the Executive branch to do their bidding, almost unquestioned. Anyone who displays, or has had a history of displaying negativity for the actions of Israel, will never be successful at participating in the higher levels of American Government by virtue of the lack of appropriate funding or support. And anyone within this government who is found to respond unfavorably toward them is quickly purged from said ranks by virtue of the same mechanisms. 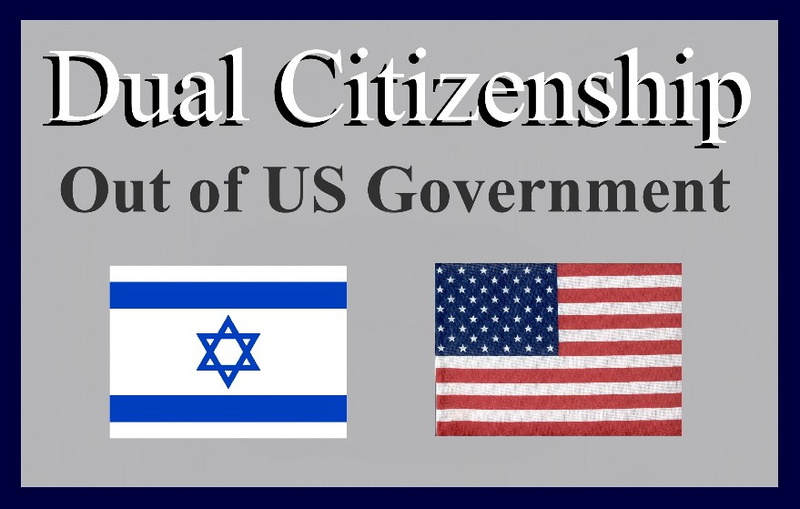 It would seem that Israelis are the only ones allowed to hold Dual Citizenship in so many strategic or high ranking US government positions. Questioning this, or even showing concern for this, is considered by them or their agents to be unconscionable, tantamount to hate speech or extreme prejudiced. Well I am not running for office … and never intend to. 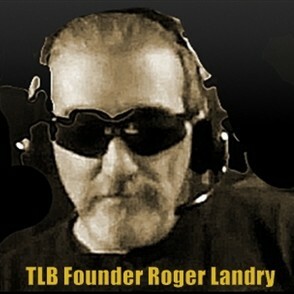 TLB will not cower from asking the Tough, Valid and Necessary questions! Here is some vital information and many unanswered questions on Dual Citizenship that should be thoroughly considered by those in positions of authority from the highest levels of this government on down, and answers provided to every American citizen. Here are just a few of many well placed government individuals with Dual Citizenship past and present the actual list is much larger! Is high level government Dual Citizenship even Constitutional when it conflicts directly with the required oath of office? When an individual swears an oath to two different countries, where does their true loyalty focus … because the answer CAN’T be both or this would in fact violate their oath of office? Have these individuals ever been asked this question … under oath? Are they asked this question whenever a conflict of interest they may be involved with, between the two nations they have sworn to serve, arises … under oath? Doesn’t their oath require total loyalty and allegiance to We The People and the Constitution … So how can that be reconciled, or even considered with loyalty sworn to two separate nations? 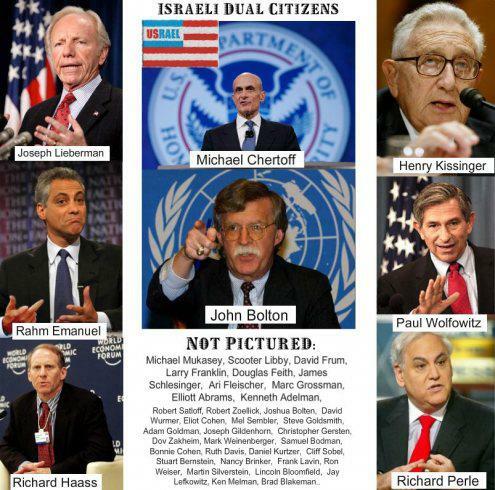 If push comes to shove between America and Israel (never say never) who will these individuals with Dual Citizenship support or favor, or will we have a multitude of foreign hostile agents embedded in our upper echelon of government? Is the above a scenario already taking place in America today, and guiding our foreign policy to the benefit of Israel above what is beneficial for America and We The People? Will we attack Iran, or put more ground troops in Syria, or any other regional sovereign nation because they threaten us from the other side of the world, or because Israel thinks we should, and thus dragging us in by leveraging their many well positioned, influential and loyal agents in this or any American administration? Has the above scenario already occurred with respect to foreign sovereign nations in the recent past (I would postulate a resounding YES)? Why does AIPAC hold much more sway over Congress than We The People? What the heck is wrong with this whole picture, and why are there so many unasked questions vital to US security? So … Have I denigrated anyone, any religion, any nation … or merely asked valid, pertinent and vital questions pertaining to the sovereignty and security of America? We The People will surely suffer the consequences! We need to consider the questions above and their corresponding answers (many we all know instinctively). This forces us to realize that a foreign entity (perceived as good or bad) resides firmly and deeply entrenched within this government of, by and for the people, exercising influence far beyond what our very founding documents deem acceptable, and far beyond what We The People (the intended Sovereigns of this now Faux Republic) can exercise. Read the above comment again!